This unique device has been helping stop false fire alarms around the world for over 30 years, without restricting legitimate alarms. Ideal for schools, hospitals, nursing homes, stores, hotels and public buildings of almost every kind. STI-1100 consists of a clear, tamperproof, super tough polycarbonate cover, frame and piezo horn that fits over most manual pull stations. When lifted to gain access to the actual alarm, a piercing 95 or 105 dB warning horn sounds. Immediate attention is drawn to the area and a prankster will either run or be caught. The cover is connected to the frame by a cable. When the cover is lifted, it hangs off of the frame and the horn will sound until the cover is snapped back onto the frame (or for the life of the battery). 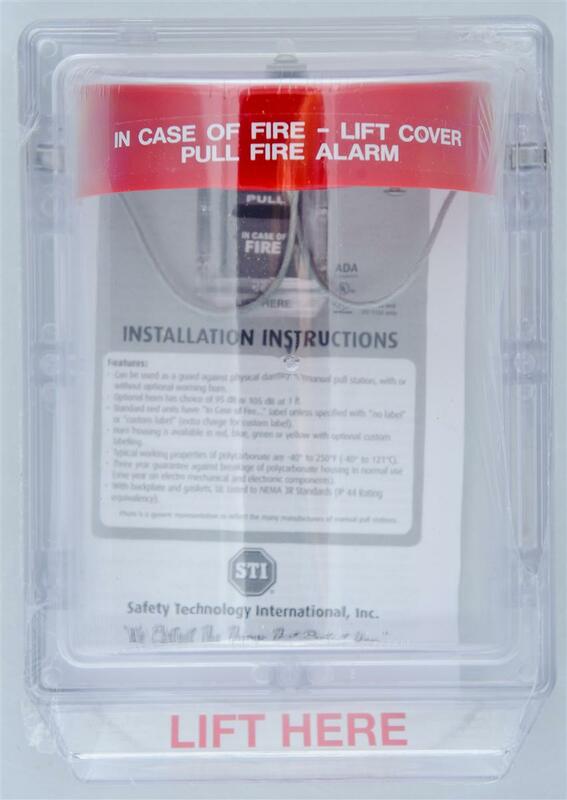 STI-1100 is for flush mount pull stations (surface – see STI-1130).